I knew I would get the typical answers of Manny Ramirez, Alex Rodriguez and Derek Jeter on the Sunday question. However, what struck me as funny as that another player popped up almost as frequently. I'm with you guys because I listed him as one of the players I love to hate as well. 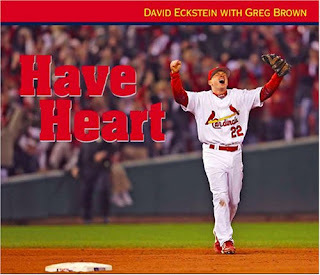 But what has David Eckstein ever done that has created such a disdain toward baseball fans? According to his bio on Wikipedia, he's the X-Factor. In addition, he was voted "Most Helpful" by his high school class in 1993. So what if the guy is listed at 5-foot-7, but is really 4-10. Is that reason enough to hate him? So what if the was the 2006 World Series MVP in what was probably the most unwatchable World Series in history? It doesn't matter. He's the X-Factor. He makes teams better. He wins World Series and gets to shop in the kid section! Perhaps Eckstein and Pedroia carpool to Baby Gap. I think people just get tired of hearing how "scrappy" he is - it's a term that, in my opinion, has become so overrated that it's underrated. I don't understand why people don't like Eckstein at all. I thought everyone loved the underdog. No one loves the underdog anymore? Are we going to start hating the '69 Mets? The '08 Rays? Eckstein is a constant reminder that you don't have to be of freak dimensions to play baseball. I like that. Eckstein isn't an underdog, he's just a mediocre ballplayer. It just gets annoying when ESPN never tires of telling you how awesome (he isn't) and short he is. Incidentally, ESPN didn't really care about Eckstein when he played for the Los Angeles Angels of Anaheim of Orange County of California of the west coast of the United States, but as soon as he donned a Cardinal jersey, he basically found a cure for the common cold while helping old ladies cross the street. That's all good and well (oh, and by the way, did we mention he's short), but he's still a pretty poor excuse for a ballplayer. Sure, he won the WS MVP, but it's not as though these awards aren't handed out in a totally arbitrary fashion (ahem, Gold Glove 1B Rafael Palmeiro). I get it. He's short. He doesn't have the same ability as most others. He's short. But that doesn't mean he's any good. I mean, at least Pedroia can hit. Eckstein, well, he's short. As an aside, it's funny you should mention the 06 Series was unwatchable. I thought so too, mostly because I can't stand the Best Fans in Baseball ™ and how truly insufferable they are -- rivaling only the Red Sox Nation in that regard. I do get the feeling many other baseball fans thought it was unwatchable because the Yankees and/or Red Sox weren't involved. Incidentally, notice how ESPN doesn't care about Eckstein anymore now that he dares play for a west coast team? That World Series was just boring, I always enjoy the playoffs and the World Series but there was just something about that one that was boring, this coming from a Pujols fan. I was glued to my tv last year and the Yankees were not in it. Greg, I hate the Mets. All years, all teams. So hating them is just continuing not starting. Eckstein is as someone put it yesterday an "overrated underrated" player. I wonder when "Scrappy" became a baseball term instead of Scooby's little sidekick. Eckstein was the only "marketable" thing to come out of that World Series because he gives the Eddie Gaedel's of the world a reason to hope. He excels at nothing but is not a terrible ballplayer. I wouldn't say I hate the guy. I don't think he is stuffed down our throats anymore..what with Brett Favre-vision and Manny's World playing 20 hours out of the day on ESPN (there is still a couple of hours of live broadcasts of sports on the station but those are interrupted with updates on Brett and Man-Rammer). I still think it's a weird reason to dislike a guy. Hate the hype, sure. I completely understand hating hype. But geez, the guy is just trying to play ball. He is like Fred Patek to me.... a thorn in the ankle to my Texas Rangers. I mean he desn't have a bad attitude or anything and really hes just out there playing ball. Don't hate him because ESPN adores him. Yeah, we hate the coverage of him more than the guy himself. I just cheer against him because of it.